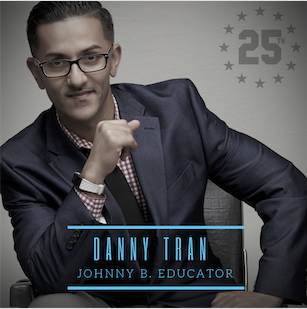 Daniel Tran, also known as “Danny” became a user of Johnny B. Hair Care products in 2012. Since then, his love for the brand and his passion for the industry, has allowed him to transcend into a great educator and business man. In the last couple of years, he has opened his own business in Austin, TX. while traveling as a Johnny B. Educator to various states, presenting the latest clipper cutting techniques at events hoping to inspire and motivate those in the industry.